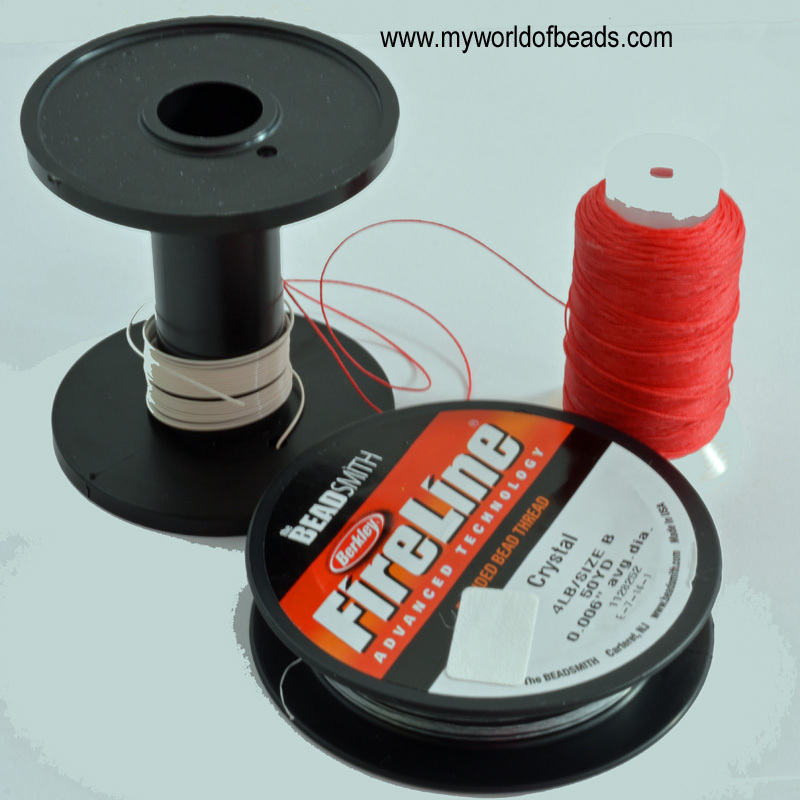 Stringing materials, as the name suggests, covers anything that you can use for stringing beads. It may not surprise you to hear, but there are a lot of different options when it comes to stringing materials! Threads are mostly used for bead-weaving and bead embroidery and there are now a range of threads available on the market. In some cases, particular threads are necessary for a project, but for the most part, it is a matter of personal preference. As I will explain, different types of thread have different properties and particular advantages and disadvantages, so this may mean you end up needing a variety of threads so that you have just the right thing for the project on which you are working. Threads also come in different colours – the range varies immensely according to the brand. So this can be another consideration when you are choosing the best stringing materials for your beading project. Wire can be used for basic stringing, but it is often used for particular styles of beadwork, for example, Viking Knit or French Beading. Wire comes in different thicknesses and different colours and, as with threads, certain types will be appropriate for certain projects. With an ever-increasing range of stringing materials, it may be no surprise to learn that wires also come in a range of colours. For some projects this will restrict what you can use. For other projects the colours open up a world of design opportunities. Other threading materials include things like leather cord and silks for stringing pearls. Increasingly beading has crossed over into other crafts, so you may find that you are working on embroidery projects using beads, or crafts like Kumihimo and Macrame. These all involve different stringing materials – some that can be used for other projects and some that are specialist to the particular craft. Although, as with everything, there are rules out there, you should also play and experiment for yourself. You never know what your stringing materials are capable of until you try!